Today it’s really cold outside. I have been recording my training sessions with Cargo since she was a tiny baby. Most of our training up to this point has been online or by myself. We have taken a handful of classes, she has a few barn hunt titles and done some private sessions. But a majority of training is at home and alone. The perk of this is that I have hundreds of hours of video on my computer that I can go back and look at when I need to. The downside is that none of these videos are labeled, categorized or have any distinguishing features besides the tiny thumbnail they give me. Enter displacement sniffing. I am going through all the videos to identify which of my dogs are actually in the video and what in the heck we are working on! I have a solid year of video to go through. Lord help me! My plan is to go through the videos and find all the places where I have been practicing with Cargo and show you the progression of some of our exercises. 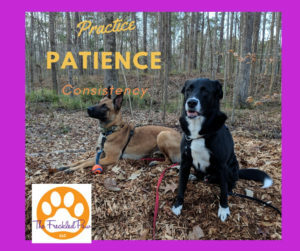 I will say my favorite part of recording my training sessions is that when I think I am not progressing I can (occasionally) go back a few videos and see where we came from and what the behavior looks like at this point. Last week it was our “back ups.” Took a look at last weeks video and well that doesn’t look so bad. We carry on. That’s the point I am trying to make here. WE carry on! We keep working toward that final goal. What is your final goal for your dog? What are you doing to get there? Are you on the right track? Does it look better than it did last month? Last week? Keep practicing and keep pushing along. With dogs, it’s the journey, not necessarily the destination.